There are several questions that we are frequently asked about flower care, flower availability and flower suitability. We have listed below some helpful pointers. If your question is not covered, then please do not hesitate to ask! What is the difference between an arrangement and a hand-tied bouquet? An arrangement is made directly into a container or vase and may contain floral foam. The container can be any shape or size. The flowers are self contained and have access to water. An arrangement is the perfect floral gift for a work place/hospital/school etc. as the recipient does not need to find their own vase. 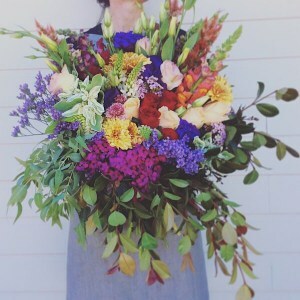 A hand-tied bouquet is essentially a bunch of flowers. 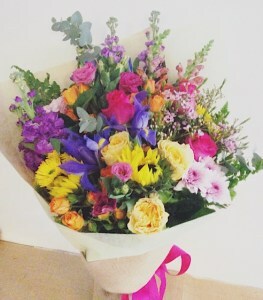 By ordering one of these, you ensure that your flowers have been expertly arranged by one of our qualified florists. They are wrapped to compliment the blooms with a cellophane water bubble on the stems which acts as a temporary vase ensuring they stay as fresh as possible (must be kept upright to avoid wet feet!). A hand-tied bouquet is the perfect gift for sending to a home address where the recipient already has a selection of vases. Caring for your flowers at home/work is simple. If you have a hand-tied bouquet; over the sink, snip away the water bubble covering the stems. Re-cut each stem about 1cm from the bottom on a 45 degree angle with sharp scissors. Place your bouquet into a clean vase filled with clean water (it is essential that the water is clean to avoid bacteria from shortening the life of your flowers). You can add a drop of bleach to the water if available. Change the water in your vase every other day, each time recutting the stems again. Avoid placing your vase in direct sunlight, in a draughty place or next to your fruit bowl… (fruit gives off ethylene gas which kills flowers). Enjoy! 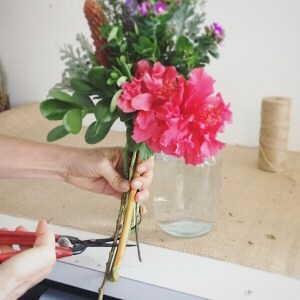 If you have an arrangement you are unable to recut the stems of your flowers but you should add more fresh, clean water every other day to ensure they have plenty to drink. Avoid placing your arrangement in direct sunlight, in a draughty place or next to your fruit bowl… (fruit gives off ethylene gas which kills flowers). If your arrangement contains lilies, removing the stamens (fluffy orange messy bits) as they open will help to keep your arrangement looking fresh and beautiful for longer. How do I take care of my roses? The stem of a rose contains tiny capillaries which allow water to travel to the head. Once a rose has been cut from the plant, the capillaries near the end of the stem close up. It is therefore essential to recut the stems of your roses frequently with a sharp knife or scissors at a 45 degree angle to allow better water flow and to avoid crushing the stem. After re-cutting, your roses should be placed immediately into fresh clean water. During the online check out system on our website, you have the option to choose the delivery date for your order. If there is an issue with that date or we are unable to deliver on your chosen date, you will be contacted by phone/email. Please refer to our delivery page for more information. Please feel free to give us a call on (08) 256 2415 today if you have any queries.